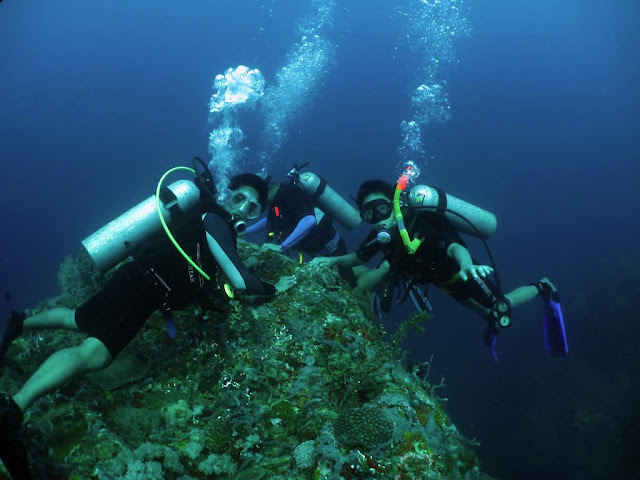 Dive & Trek is a dive resort located adjacent to a protected marine park in Bauan, Batangas. It is about three hours away from Manila. 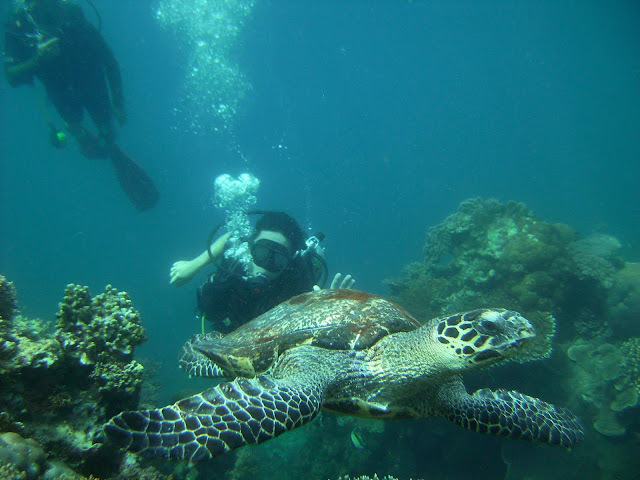 Dive & Trek is my default scuba diving location, just as San Juan is the usual surfing town that I go to. I was able to dive there several times, and I actually completed my open water certification there. 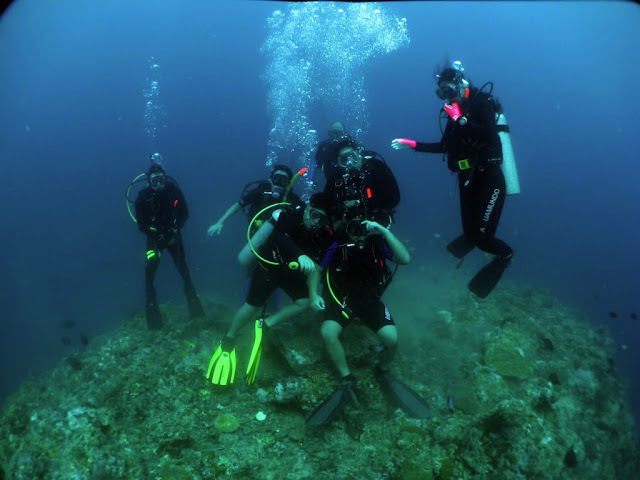 One of the more memorable dives that I had in Dive & Trek happened many moons ago, when we did four dives in one weekend. 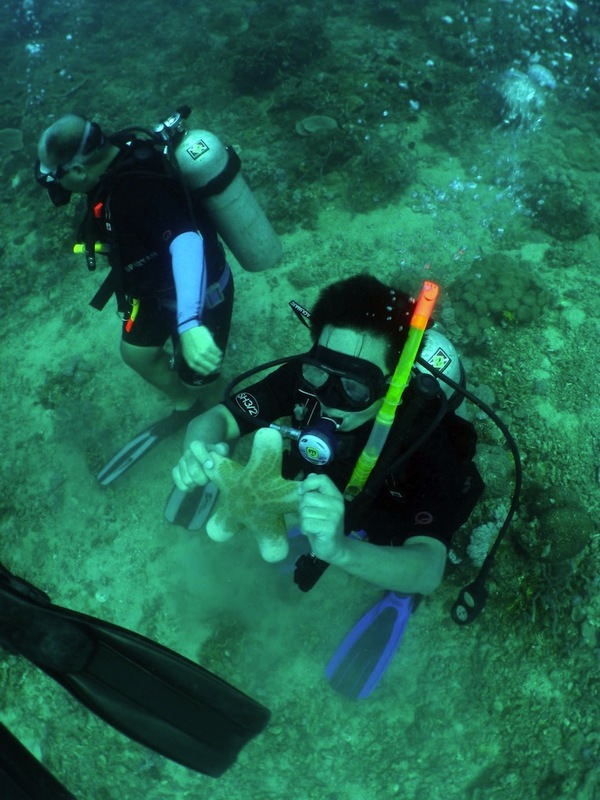 Me and my scuba diving buddy, James, arrived there one Saturday morning. We met up with our dive master, Mark, and the rest of the party. Our first dive of the day was in a cavernous dive site called the Bat Cave, where we reached a maximum depth of 80 feet. This is quite exciting for me as this was one of my deepest yet (I think I was able to go down to around 100 feet in my later dives). I did not go inside to the mouth of the cavern (only Mark and one of our companions, Edward, did). My license is only for open water diving, meaning I cannot where there's something over my head (but I broke this when I went inside the cargo hold of the wreck in Coron. Our second, which we did in the mid-afternoon, was just in front of the resort, just off the reef wall near where the giant clams are seeded. Our max depth was just around 45 feet. The dives on the second day were a lot more exciting. Our first, in the morning, was in the site called Pinnacle, in Ligpo Island. 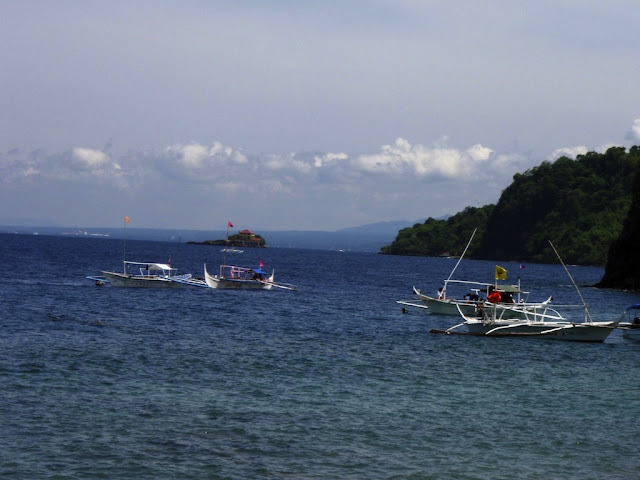 The island is just located off Bauan, about 20 minutes boat ride from the jetty. The dive site has an average depth of 95 feet, with a max depth of 200 feet. 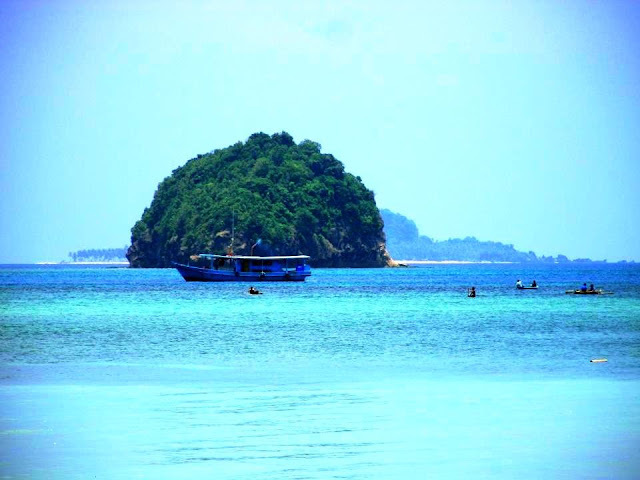 It has plenty of reef walls studded with corals, and a strong current. We could actually see the air bubbles floating up diagonally due to the current. We we had our pictures taken hovering over a reef, we have to hold on to it because we'd be swept away too. We went down to about 70-80 feet. Underwater I've seen nudibranchs and lapu-lapu (grouper), and plenty of fire corals, which we were warned beforehand not , in any circumstance, to touch, as they are poisonous and the sting has a burning sensation that will last for about 2 months. The second dive for the day was potentially dangerous, as we went deeper than the first. We went to the Bat Cave once again, on the way went through the site called Basilica, which has a grotto (with a statue of the Virgin Mary, and a cross at one of the reef walls. We were taken (that's me and James) at the mouth of the cave, which is around 90 feet deep, which later we realized that we shouldn't have gone down, as this would be a reverse profile. A dive profile describes a diver's pressure exposure . It should be in such a way that the succeeding dives be should shallower than the previous one. 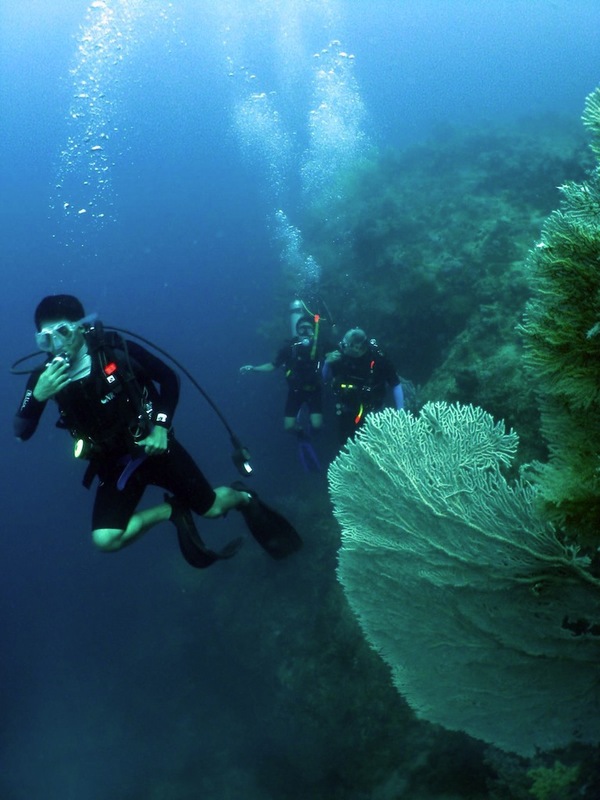 Diving deeper than the first could potentially cause decompression sickness. To mitigate the, we have rested for a little less than an hour hovering over the corals, and made a slow ascent to the surface to out-gas the nitrogen when we felt it safe to do so. The realization about it gave me and James a bit of a scare, as we got afraid that we might get decompression sickness and everything. Fortunately nothing untoward happened, so there. 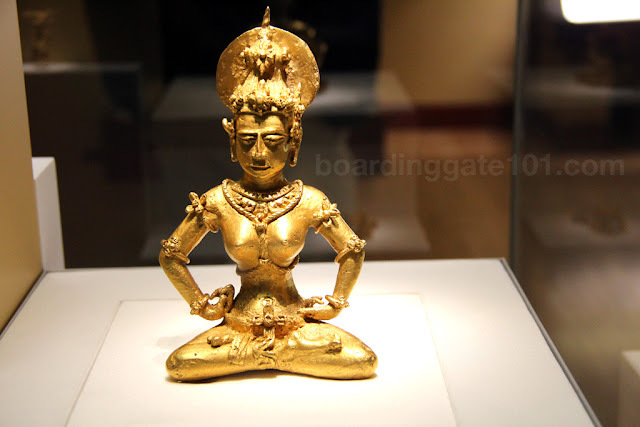 There are two ways to get to Dive and Trek. One is through the town of Lemery, and the other through Lipa City. Here's a map with detailed instructions. If you need a scuba diving instructor or somebody to organize the dive, you may contact my instructor, Mark Genuino, at iDive Manila. Inggit ako, I don't have a good underwater cam. Is that James in the last picture? 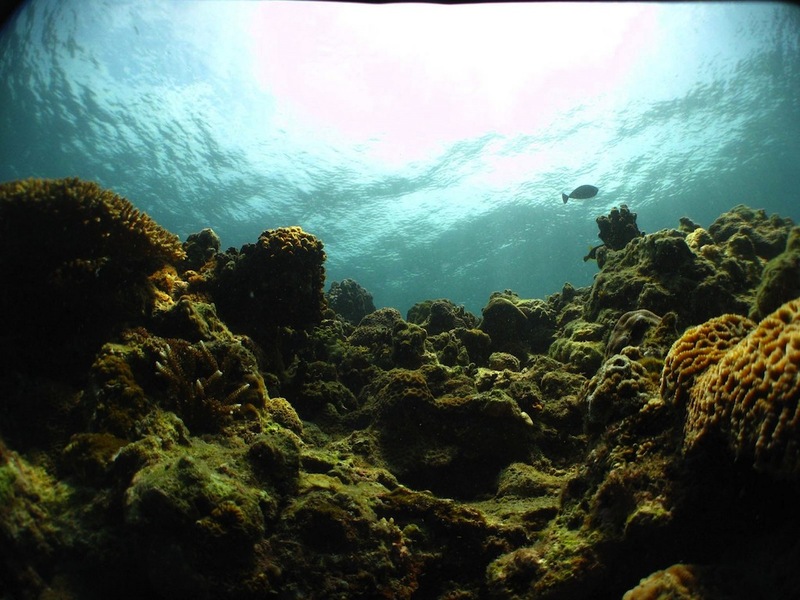 whoa the reef wall photo is just so oh amazing! hmmm it's really risky to be a lover of the ocean, sigh.